Undrafted 10th year center Pascal Pelletier(23) returned to North American hockey signing a one-year two-way deal with Vancouver Canucks for 2013/2014. He spent the last three seasons in the Swiss elite league NLA, skating games for Langnau, putting up close to point-per-game numbers. The strong skating, stocky 5’11” 196 lbs. 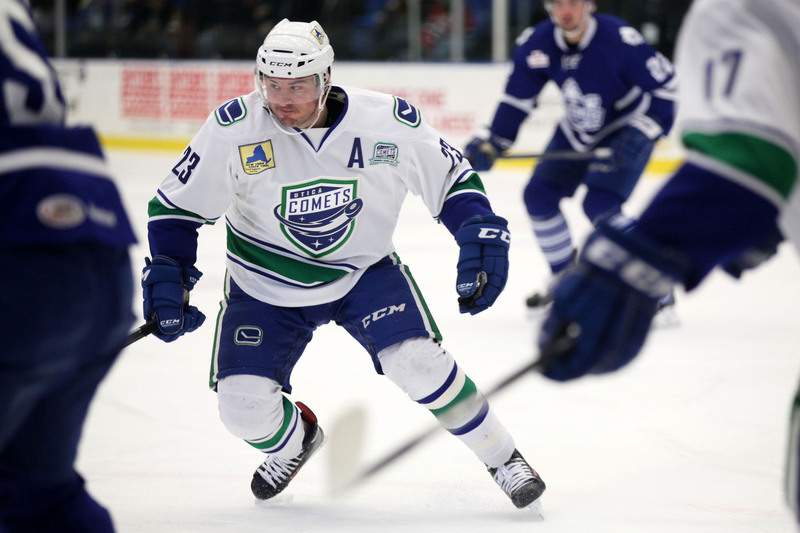 forward was reassigned to expansion team Utica Comets and set a new career high assists with 40 in 69 AHL games. His 62 points were also second highest of his pro career. He appeared in 3 games with the parent club but failed to hit the score sheet. He’s played 16 total NHL games but has yet to register a point. Boston Bruins‘ 3rd year right wing Matt Fraser(25) accomplishes scoring an overtime game-winner in the NHL and in the AHL (for minor league affiliate Providence Bruins) in the same postseason, a first in hockey history. The undrafted forward was signed to a one-year extension making it three straight seasons in Dallas Stars‘ prospect system, but only a week or so later found himself tied as a spare part in a 7-player deal that sent him east. The bigger than he looks at 6’2″ 209 lbs. forward added an assist in his second Stanley Cup playoff appearance. The almost 24-year is old is set to become a restricted free agent for the second time in his pro career but it would be zero surprise to see Boston tie him up for a couple more campaigns. A pair of Swedish goaltenders, Niklas Svedberg(1) and Anton Forsberg(35), called in to put out the first period 7 goal explosion in the deciding game 5 of the AHL Eastern Conference Quarterfinals between visiting, winning Providence Bruins and home team Springfield Falcons,exchange some home country good will in the handshake line to conclude the series. The two starters allowed 4 and 3 goals in the opening stanza and yanked. Each back-up net minder let in the first shot they faced but that was all she wrote for the eventual winner. 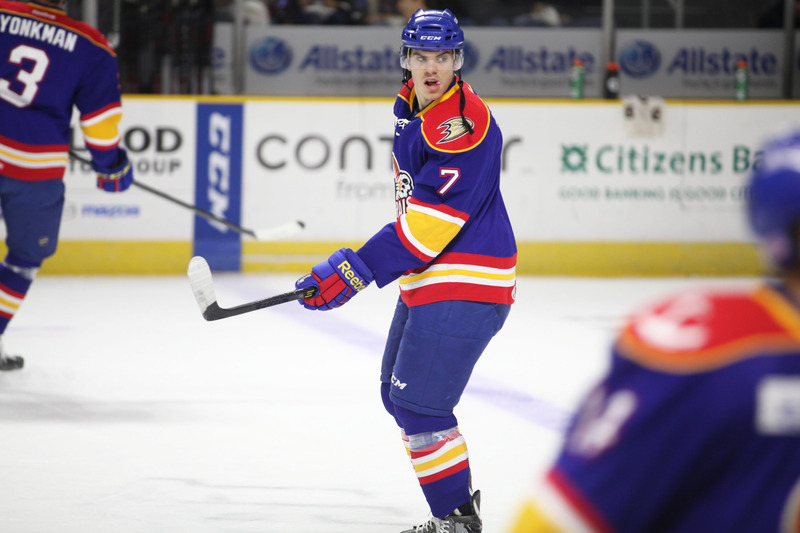 Norfolk Admirals‘ center Maxime Sauve(7) has definitely experienced some troubles in his fourth pro season finding a permanent spot on a roster. Traded to Chicago Blackhawks near the end of last year, the final campaign of his entry level deal, he was left unqualified rendering him an unrestricted free agent going into 2013/2014. Invited by Anaheim Ducks to their training camp, he was released from his pto and reassigned to their minor league affiliate, where he started the season. It remains unclear if he ever signed a contract but the 6’1″ 190 lbs. forward skated in 47 AHL games with the team but put up his fewest point totals and was watching contests from the stands on too many occasions. He has been prone to upper and lower body and concussions throughout his playing time. He was even injured in his one NHL game with Boston Bruins. Sat for the first game of the Calder Cup Playoffs, he was inserted into the lineup in the 2nd meeting, which was a win evening the series at 1-1. The 24-year old was the hero scoring the 1st overtime game-winner of a 1-0 game 3 victory. He’ll no doubt be back to see if he can continue on a streak and help the Admirals into the next round of action. What happens after the end of the current run is up in the air, as he will once again be unrestricted. 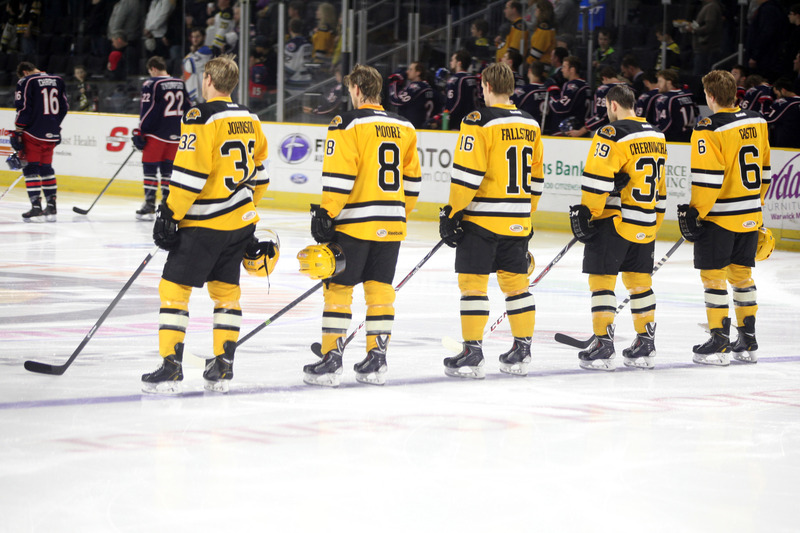 A somewhat odd Providence Bruins‘ starting lineup for possible elimination game 4, home at the Dunkin’ Donuts Center: Nick Johnson(32), captain Mike Moore(8), Alexander Fallstrom(16), Andrew Cherniwchan(39), Chris Casto(6). They got the job done with a convincing 6-3 win sending the AHL Eastern Conference Quarterfinals‘ series to a decisive game 5 with Springfield Falcons. Los Angeles Kings‘ 6th year defenseman Andrew Bodnarchuk(7) was the AHL plus/minus leader at the end of the 2013/2014 regular season with a mighty +43 rating. He also posted career high numbers with 8 goals and 24 assists for 32 points and had a new record mark of 129 shots on net. The 5’11” 190 lbs. d-man is considered somewhat small but plays with plenty of snarl and a gritty edge that’s fully effective in all three zones. He signed a two-year extension heading into the current campaign after coming off a successful first season with affiliate Manchester Monarchs. 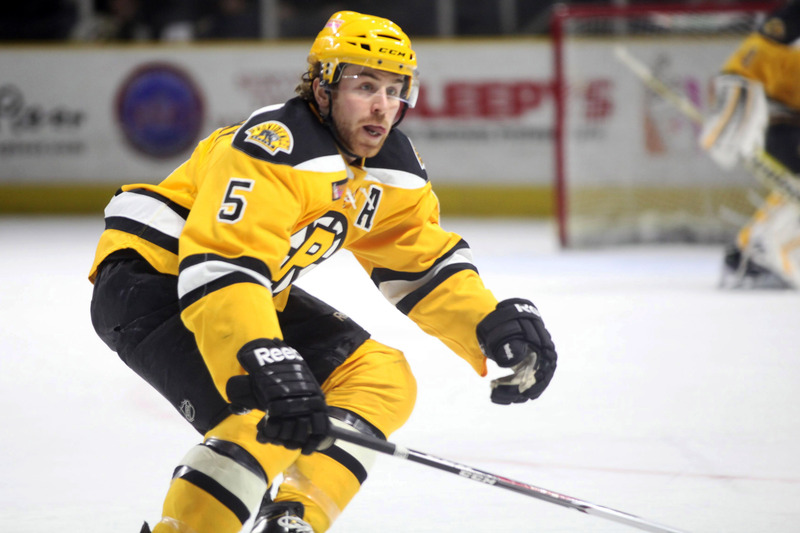 Previously he spent his initial four campaigns in the Boston Bruins‘ organization, mostly with Providence Bruins. He’d only played in 5 NHL games with no points and a -2 rating. The 25-year old has already appeared in an eye-popping 412 minor league contests and with plenty of determination seems like he could find his way into a bottom six role at some point. 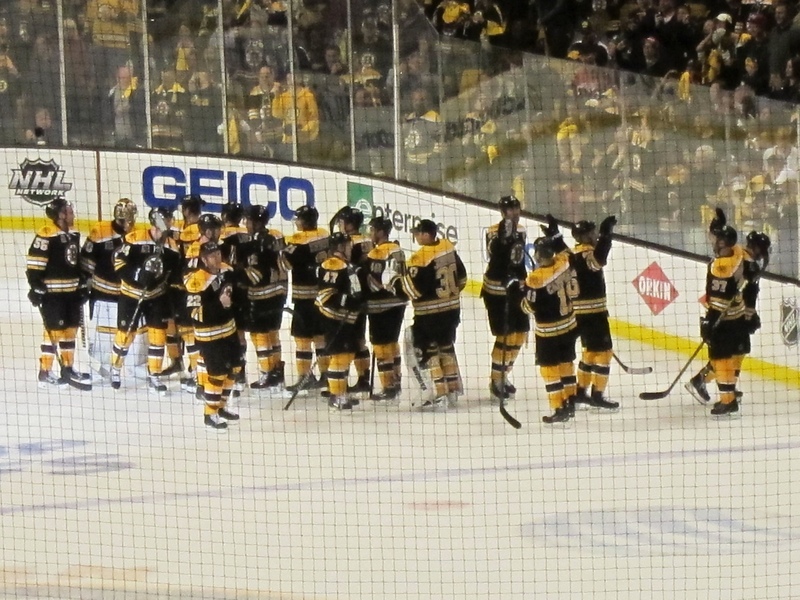 Boston Bruins‘ celebrate the 4-1 win over Detroit Red Wings in game 2 of the 2014 Stanley Cup Eastern Conference Quarterfinals to even the series at one game apiece. 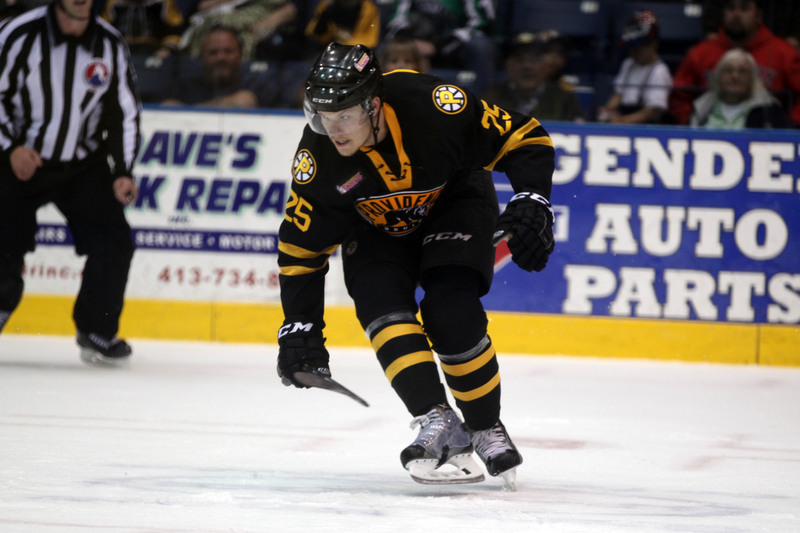 Providence Bruins‘ forward Justin Florek(57) on recall to the parent club had the opening tally and 2nd year defenseman Torey Krug(47) had a pair of assists. Both teams have three tough wins to punch their ticket into the 2nd round. Goaltender Michael Hutchinson(33) has been on quite the ride through the hockey ranks this season since being left unqualified by the team that drafted him, Boston Bruins. Originally a 3rd round pick in 2008 (#77 overall), he spent the first three years in their prospect system tending net mostly with Providence Bruins. 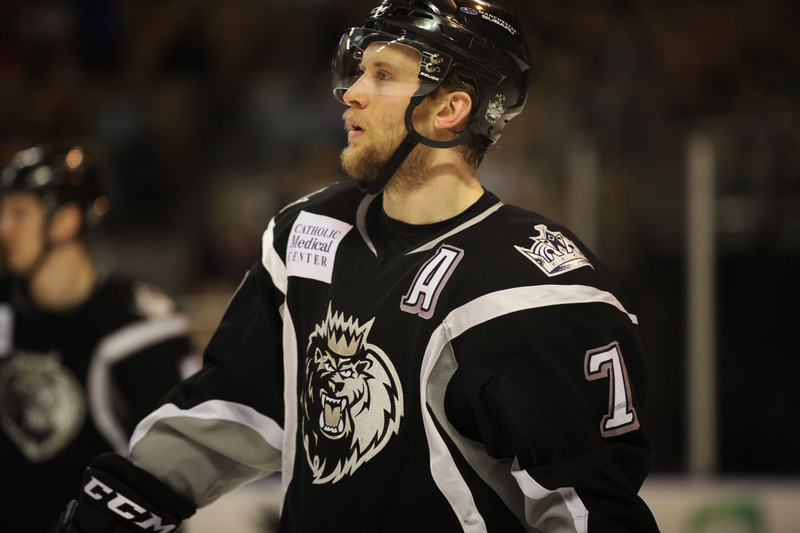 He was reassigned on a couple of occasions to ECHL affiliate Reading Royals through his first two campaigns. None of it compares to the roller coaster ride he’s still on this season backstopping cages in three different leagues. The almost unassumingly large 6’3″ 192 lbs. 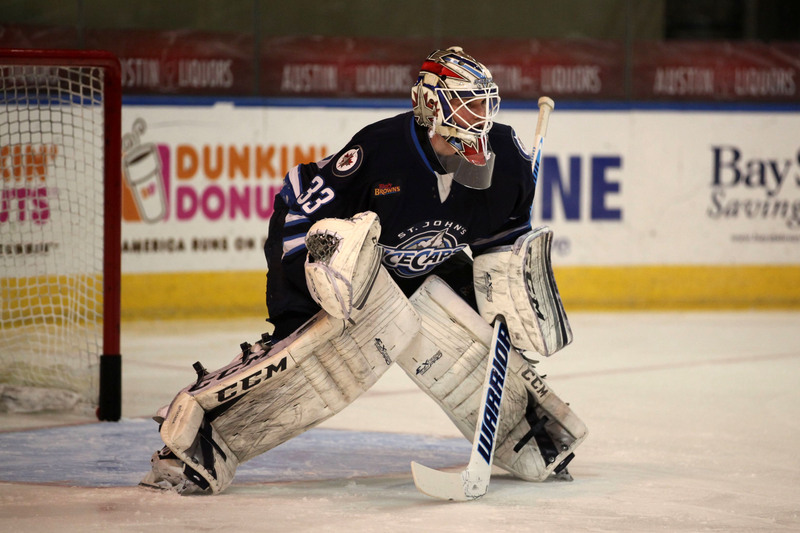 free agent net minder signed fairly quickly with Winnipeg Jets for a 1-year 2-way contract. He was in training camp but quickly reassigned to AHL farm team St. John’s IceCaps and it didn’t stop there as he was sent along to Ontario Reign to start his fourth pro season. This was where he stepped it up because in 28 starts he won 22, good enough for third in the league, lost a lowest 4 contests and posted a 2.08 GAA and .921 SV%. He would receive an early Christmas gift on recall but it didn’t last as he was sent back down again. In early 2014 though, he was summoned up once again and due to injury ending up splitting starting duties. Earning his time in net, he managed a 15-5 record, helping to solidify the IceCaps‘ postseason berth. The stellar play of the 24-year old earned him his first NHL games. In three appearances he won 2 and lost 1. One of his wins was against his former team in a shootout and his 1.64 GAA and .943 SV% should almost assuredly score the future restricted free agent an extension. First up though, he could be on his way to help bring the Calder Cup to the Rock. Boston Bruins‘ 3rd year defenseman David Warsofsky(5) is in the final campaign of his entry level contract, putting up career high point marks and has a +10 rating in the AHL with minor league affiliate Providence Bruins. The mini-sized 5’9″ 170 lbs. blue liner is also on the short list of d-men recalled for action with the parent club. For his lack of physical presence out there, he plays a smart, minimum risk style with an offensive upside. He’s been summoned up 3 times to date this season. In 6 NHL games he scored his first big league goal and added an assist. He was originally a St. Louis Blues‘ 4th round pick in 2008 (#95 overall) and rights traded in 2010 and signed in 2011 in time to finish the regular season with the farm team. The still super-young 23-year old, having played three seasons at Boston University and basically grew up skating the Massachusetts hockey route to a pro career. He’s a restricted free agent at the end of 2013/2014 but it would be like zero surprise to see Boston offer him a 2-year extension. 3rd year undrafted center Carter Camper(11) was recently involved in a minor league deal that sent him from Boston Bruins‘ prospect system to Columbus Blue Jackets. He’s skated most of his games in the AHL with affiliate Providence Bruins and has displayed a slight down tick in point production but could start to ignite in his new environment. The very small, generously listed at 5’9″ 173 lbs. forward played in 3 NHL contests in his rookie season scoring one goal but somehow seemed to slip on the depth chart. He was initially signed to a 2-year entry level deal and qualified for another. His contract expires at the end of 2013/2014. The 25-year old will become an unrestricted free agent and free to sign anywhere. 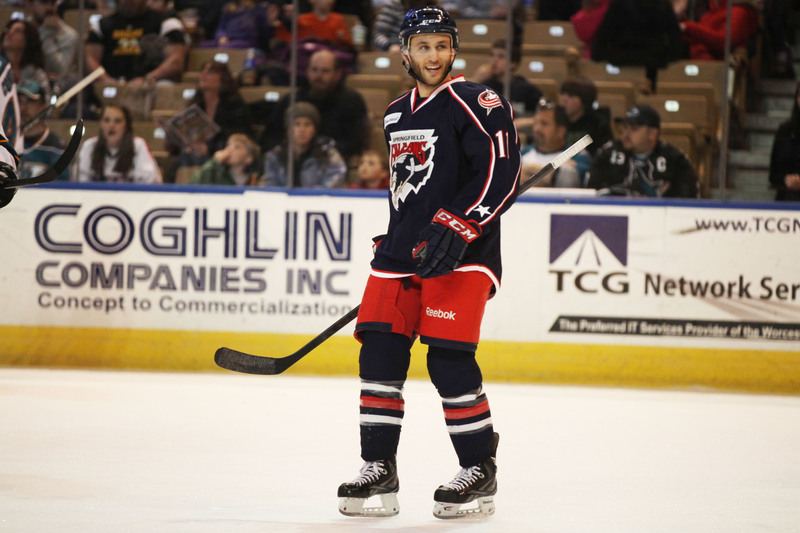 He was injured at the time of the trade and just started playing again with Blue Jackets‘ farm squad Springfield Falcons. A real bright spot in last season’s Calder Cup Playoff run, he struck for 8 goals and 5 assists in 12 games with a +6 rating before bowing out late in the second round. He’s always been a more than a point-per-game guy through American junior hockey and four years at Miami University. He was captain in his final season at the school. Depending upon how he produces for his new team, he could be signed to stick around pretty quickly or might decide to see if the overseas ice is any better for his game.